Merry Christmas to all of you! And happy feast of St. Stephen! I was looking through some old posts of mine and thought any name lovers that might be reading would be interested in listening to this podcast I was featured in a year ago with the amazing Haley from Carrots for Michaelmas and Christy from Fountains of Home, chatting about Catholic baby names. A fun little diversion on a cozy day! I wrote this article for Nameberry last year, and thought it might be helpful to post it here in case you know anyone expecting a baby in the next six weeks! I recently went back through the Nameberry archives to see what posts have been done about Christmas names and found articles listing names relating to Christmas movies (Ralphie, Zuzu) and TV specials (Linus, Virginia), seasonal foliage (Holly, Ivy), colors (Crimson, Scarlet), Elf on the Shelf names (Buddy, Nick), and, of course, the major players (Mary, Joseph, Emmanuel). What can be said about names relating to Christmas that hasn’t yet been said? Hello all! I'm delighted to be a new member of the ACWB, and wanted to introduce myself! 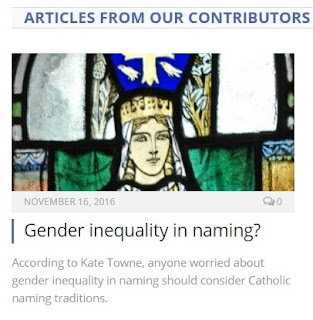 I'm Kate and I write about naming (baby and otherwise) from a Catholic perspective at my blog Sancta Nomina. Expectant parents, Confirmation candidates, clergy and religious, and namiacs of all kinds are very welcome! 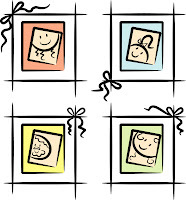 I post a name consultationevery Monday; birth announcementsas I receive them; articles at CatholicMom monthly and Nameberryoccasionally; and various other bits of information and resources and recommendations for those who love the names of our faith as I do. I love to connect on social media as well -- all that information and anything else you'd like to know can be found here. Thank you for welcoming me! Chances are, this baby girl is named Sophia. BabyCenter, a popular parenting and pregnancy website, released its annual list of the 100 most popular baby names (not to be confused with the Social Security Administration’s annual report of the most-given names). Sophia and Aiden, last year’s respective leading girl and boy baby names, retained their status as the most popular baby names in 2011. Other fashionable female names — namely, Ava, Abigail, and Isabella — kept their place in the top 10. Meanwhile, male names continued the trend of “n” endings; joining Aiden in the top 10 are Jackson, Mason, Jayden, Ethan and Logan.